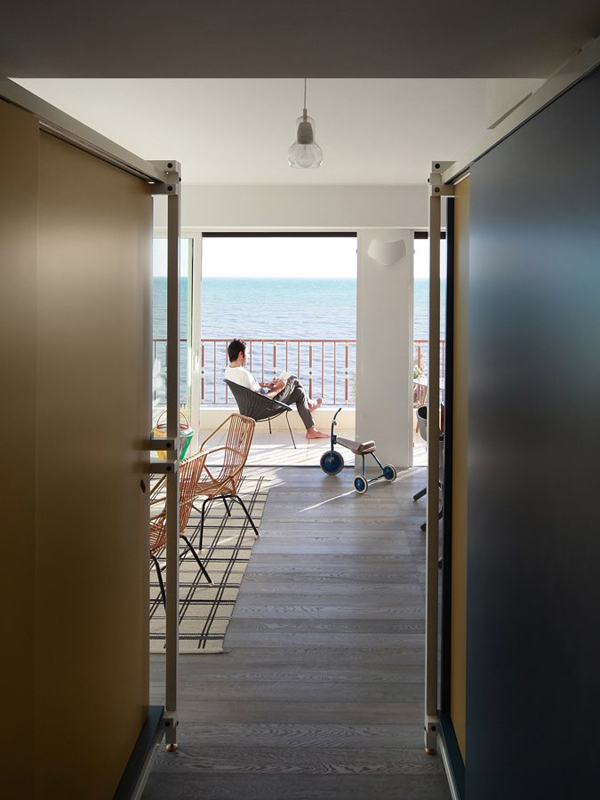 Fun House is a curious project by Studio UdA’s Andrea Marcante and Adelaide Testa that turned a small apartment into a beach house. 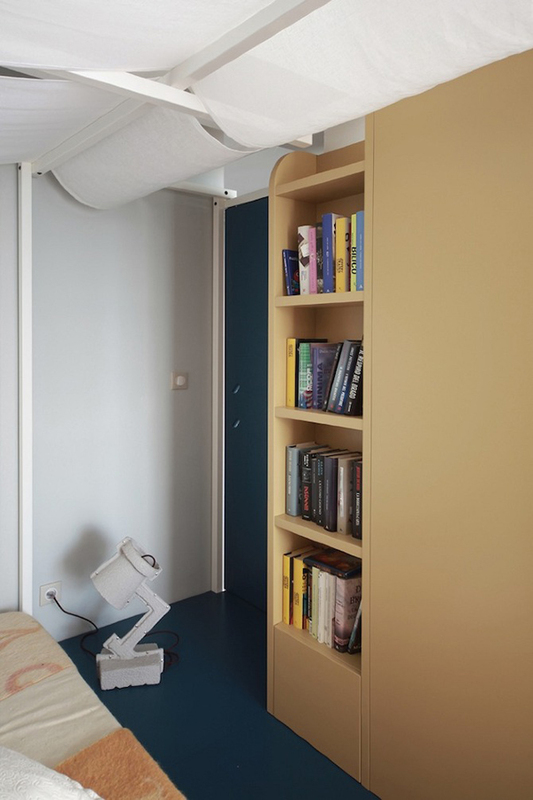 This 40-square-meter apartment in France is located in a 70’s building and designed in blue and yellow color scheme mixing vintage style and a beach theme. 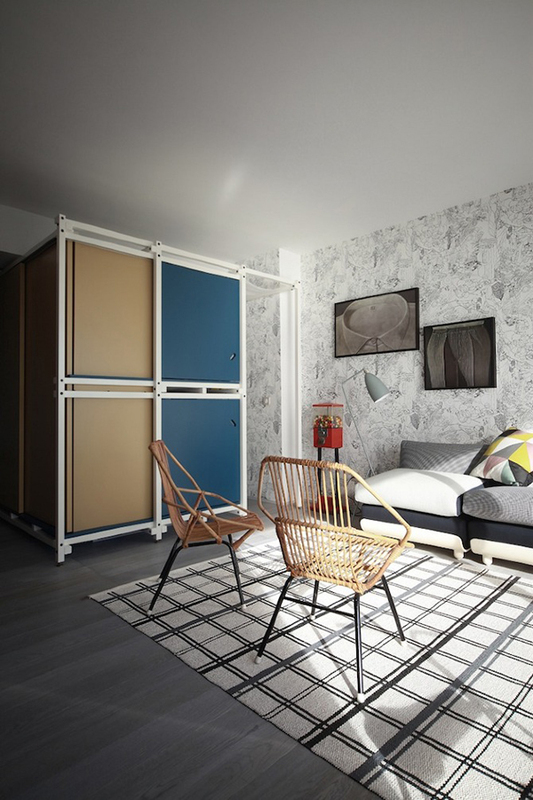 Since the apartment is small and the task was to create a big lounge area and two separate bedrooms, the designers created two sleeping units with bunk beds that close from the living area and a kitchen thanks to sliding doors in the structure. 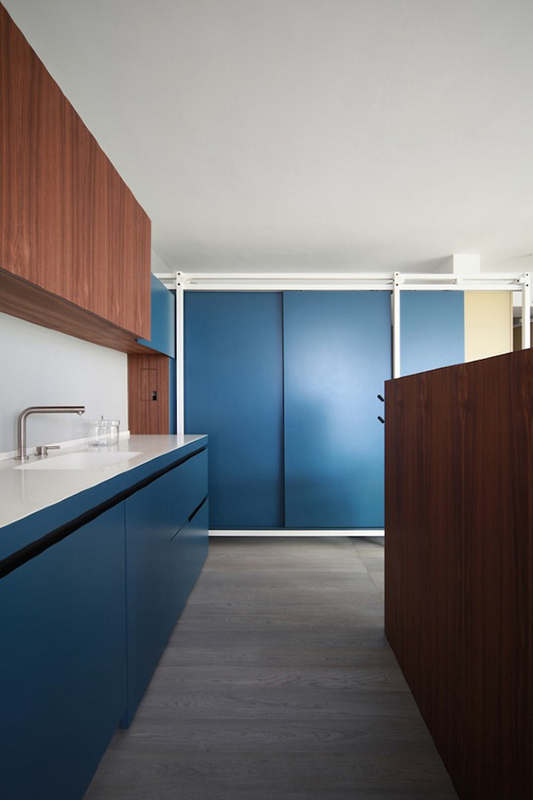 The units are made out of MDF panels painted bright blue that continues into the kitchen and dining area, which are also finished with brown wood. 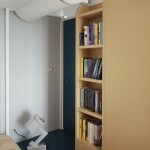 The other wall, at the side of the living area is covered with wallpaper. 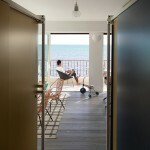 A lounge area, as well as the sleeping units, overlooks the sea. The balcony terrace is furnished with a wicker chair as is the living area inside the house. 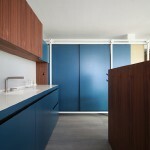 Since the apartment features an open plan the kitchen and dining area are adjacent to the living area and can be open or closed to the sleeping units. 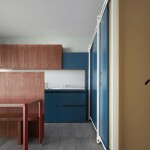 A beach theme manifests not only in a color scheme. Wicker furniture and light sand-like floors add to the apartment’s beach house atmosphere. 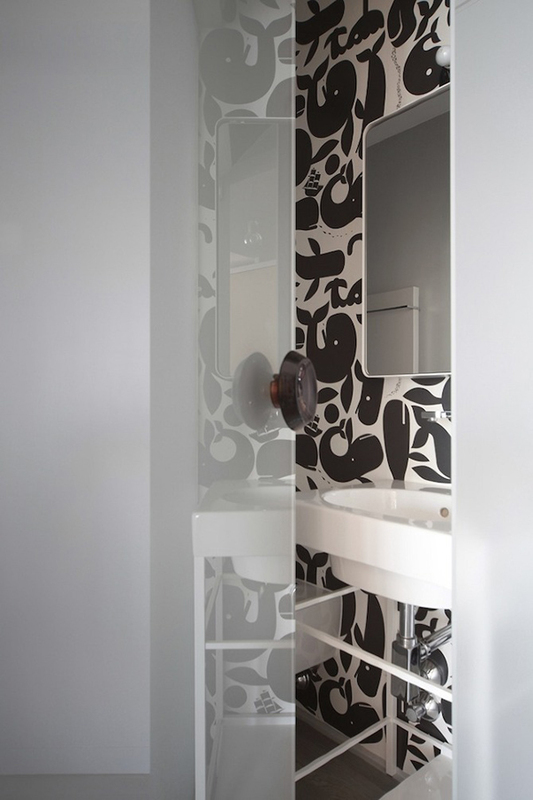 The water views emphasize the design and decor of the Fun House and create an illusion of being on the beach. 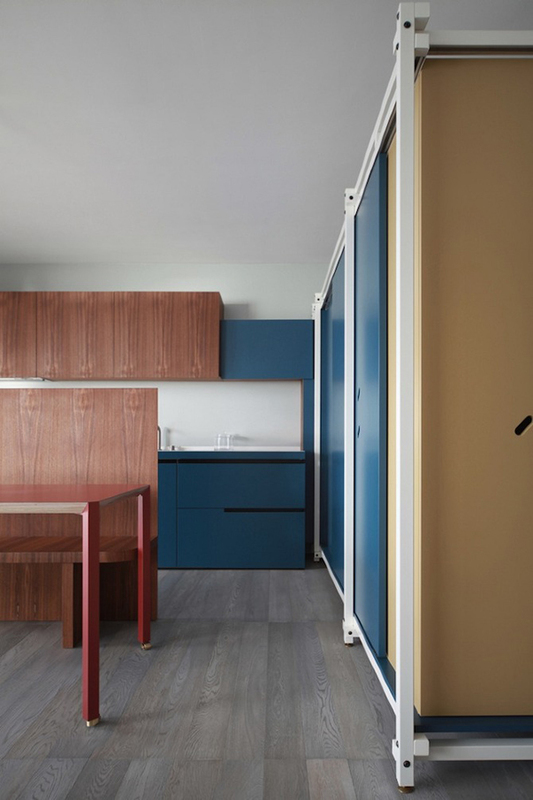 Cramming two bedrooms into a small apartment is not an easy task but Studio UdA did a great job creating all the necessary zones for the residents as well as separating them from the rest of the house. What do you think about Fun House?